So, Sunset Overdrive, how did we get to this point? I wasn’t really supposed to like you! Honestly, that’s how I feel after sitting down for a week with the game. A game that takes place in what seems like some sort of apocalyptic nightmare brought on by some money hungry corporation. A game that is exclusive to the Xbox One and was developed by a company that was, for a time, only developing Sony titles. Based on all those factors, I actually see myself as someone upset that I was betrayed by Insomniac Games and fearful to play it due to what appeared to be zombies or other disgusting mutant-y things all over the place. Could I ever be far from that! I ended up picking up the game initially because I wanted to win a white Xbox One and could have cared less about the game. It wasn’t until I arrived at the midnight launch event at the Microsoft Store did I realize I didn’t have to pre-order it in order to win. All I had to do was just be there. However, while I was there, I figured I’d try the game. I sat down in front of one of the demo systems set up for the game and got my 15 minute play-through on. That 15 minutes was very transforming as I was enjoying what was happening on screen. Its very fast-paced and colorful and hilarious. After playing, I made sure I finished paying on the game and counted down to midnight. I knew this week was going to be an awesome week for me! I still can’t believe I actually typed that, but that’s really how the game feels! Essentially, the game puts my fears to rest as to what the game is about. Its not a zombie apocalypse. Plain and simple. One, the story establishes that the events you are experiencing are only limited to the city you are trapped in and you are not fighting zombies. You are however fighting a QA nightmare as people are turning into mutants after a rushed release of a product. One of the NPCs who used to work for the company repeatedly reminds you that this was all an accident and that its an isolated event and is quick to correct you every time your character says otherwise. Speaking of character, there isn’t much in the way of what I would call customization, but that’s a good thing for me as I don’t like sitting in menus trying to create someone who looks like me. I was, however, able to create someone who maybe somewhat resembles some type of hero version of me. Its rather funny to look at and totally makes sense in this world which is just as over-stylized as I made myself look. And this game plays with that a lot. Its very good to have a game that is just so ridiculous that it has no other option but to poke fun at itself for being too ridiculous. I love how the game does poke at specific tropes in video games and other mediums. A couple of examples is pointing out characters talking to each other through a phone that neither is actually holding or has been physically manifested in some way and using the game’s UI to defeat enemies. 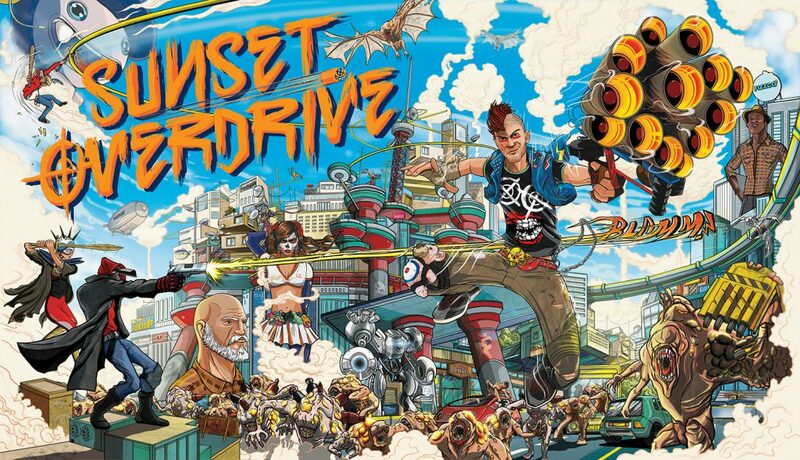 Sunset Overdrive has been keeping me laughing so much my wife thinks I might have just actually snapped. The weapons in the game are just fantastic! I haven’t quite unlocked or bought them all as of this writing, but the ones I do have access to are purely amazing. I do find myself use some more than others.After playing some online, I found out that some are supposed to be used in certain ways and weren’t meant to be multi-use. For example, using the shotgun that sets things on fire on a huge enemy is good after the first shot only if you switch over to the handgun immediately after. Going back to the multiplayer, that mode is just plain nuts! It gets crazy when you have one person causing all the mayhem, but when you add seven others who are shooting in every direction (and not knowing what they are doing), no words can describe how crazy it gets and how fun it becomes. I was having so much fun during the session that it was pointed out that the game, despite all of the gunfire and explosions and fireworks and enemies and players on screen, the framerate barely dropped. I had a couple of instances, but it seemed to only happen when it was loading things from the server and may have also had something to do with the fact I was streaming while playing online at the same time. Not really! You guys should have known this was coming. There are a lot of good things about the game, but with good their does come some bad. The only thing that I don’t really like about the game is the way traversal is handled while in combat. Seeing as that most of the things you do during missions is confined to a certain area, trying to adhere to the “floor is lava” routine becomes a little difficult for me. This isn’t a fault of the game by any means. I’ve seen how people can get it to work in their favor in countless videos. However, for me, it gets a little confusing as I’m having to worry about enemy positions, ammo management and “Wait! Where in the world am I going?! The fight’s over there!” Also, with enemies that shoot projectiles, it becomes real hard to avoid in tight spaces. But, wait! There’s more! I totally forgot about the tower defense missions you have to play every-so-often when you unlock/discover new parts to the city. Essentially, upon discovering a new base, you will unlock new traps to use to defend the base during these missions and are forced to use them to defend the base. It would be nice if I could skip thsese missions, but they appear to be a part of the story. Luckily, the mode is very forgiving and I find it easier to just to carelessly shoot what you can, make it to the second wave, lose the second wave, restart then win! Probably not within the plan to be an ace at the game, but I don’t care! I’m having too much fun! Well, that’s what the story suggests your character does after having a dead end job before all this went down. It has been a nice change of pace for me as this is a game I would not have normally bought and probably wouldn’t have if it wasn’t for my increasing curiosity and Microsoft having demos of the game available at the midnight launch. Despite the small things I don’t like about the game, they are constantly forgotten by how much fun I’m having while playing. I do look forward to wrapping it up soon, but as it is November, there are plenty of other games that I would at least get a taste of before that. I honestly think that if you just want to have “dumb fun” while playing a video game and just laugh at what society and video games in general have become lately, you should totally pick up this game!